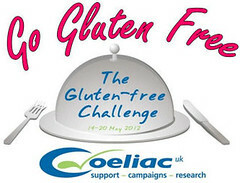 This week is Coeliac Awareness Week in the UK (from 14th to 20th May 2012) - it's something close to my heart as it runs on my side of the family. Coeliac (or celiac) is a disease that affects around 1 in 100 people, it is an autoimmune disease causing the body’s immune system to wrongly attack itself when it comes into contact with gluten. Eating gluten damages the lining of the intestines, resulting in illness and poor absorption of food and nutrients. There is no cure, but thankfully if you follow a gluten free diet your body goes back to being healthy and happy again. Katie, from Apple and Spice, is holding her first blogging event and she's inviting us to make something gluten free to help raise awareness of this condition, and to prove that going gluten free doesn't mean going without. For my entry I made up this rather lovely banana and coffee cake, with a sprinkling of chocolate chips for that little something extra. It's so light and moist you can leave the frosting off and just dust with icing sugar if you prefer. Put the eggs, mashed banana, light brown sugar, soft butter and coffee powder into the bowl of a freestanding mixer and whisk for 5 minutes on medium to high speed. In a medium sized bowl, mix together the flour, baking powder and bicarb of soda. Pour the flour mix onto the egg batter and gently fold in with a large spoon or spatula. Divide the mixture between 2 lined cake tins 20cm/8" in diameter. Sprinkle a tablespoon of chocolate chips onto the cake batter and bake for about 20 minutes (until springy to the touch). Cool before frosting. Whisk the butter and icing sugar together in a large bowl using either a hand held electric mixer or a freestanding one, on a slow to medium speed. In a small bowl, mix the milk and coffee powder together, then slowly add to the butter and icing sugar mixture. Turn the speed up to to a high speed and whisk for about 5 minutes until the frosting is light and fluffy. Divide the frosting in half and use one half to fill the cake and the other half to ice the top of the cake. Wow Nice the cake looks divine! Thanks for your entry. i often feel so much pity for people who can't tolerate gluten because i feel like they're missing so much, but it's becoming unnecessary since terrific people like you are creating DELICIOUS recipes that they can enjoy! lovely work, nic! What a great looking and moist cake Nic. The choc chips had to be there, yay! How wonderful that talented food bloggers like you can create such delightful stuff for gluten intolerant diets. This ones a treat! I ate Gf for 1 year & loved it & now I eat a few times a week gf! 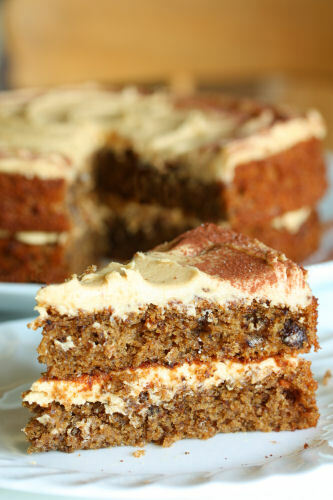 This is one rich, gf & fabulously looking cake! Yum Yum Yum! That coffee frosting looks so appetizing too! I have started collecting GF recipes. I love how creative you guys can be in making such. I am definitely giving this a try. 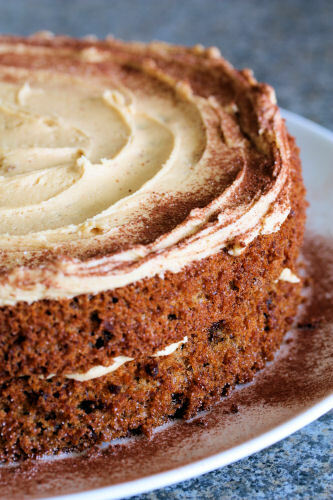 I love banana cakes, and guess what I have never made a GF cake in my life, so this one is bookmarked for sure. Looking forward to making it in the v. near future. This one is truly gorgeous. It's amazing how far gluten free desserts have come...that looks amazingly delicious. Coffee and banana is always a winning combination. 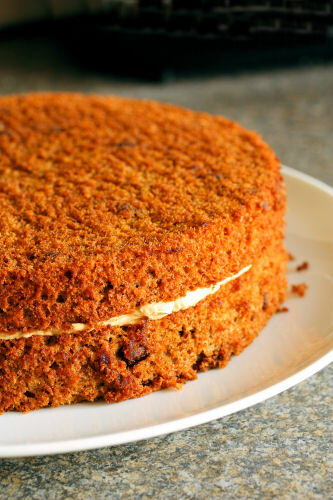 The texture of the cake looks wonderfully soft and moist. I don't even like coffee, but I have to stop and say the cake looks beautiful, especially the way you have finished it off.